Check out our sensational Summer strawberry cobbler! It’s made with simple ingredients and stuffed with plump strawberries and topped with a moist crust. Next to lemons, strawberries are one of Summer’s greatest ingredients to work with when it comes to making a sensational dessert. Speaking of strawberries, we have developed a strawberry cobbler that is sure to be a hit with the whole family. It is stuffed with plump, juicy strawberries and topped with a unique sweet crust. With all the cobbler options available to you, what makes this strawberry cobbler so special? Well, as usual with our recipes, it starts with simplicity. We use frozen berries instead of fresh fruits. This means preparation time is severely reduced. Additionally, if you sometimes struggle with dexterity in your hands, using frozen products prevents the need for tedious knife work. The filling only uses four ingredients, and most of those are commonly found in the typical kitchen. It ends up turning out sweet and still has all the texture of a strawberry cobbler made with fresh berries. Another aspect of this strawberry cobbler that makes it sensational is the crust. This version is based on my mother’s recipe. She always made a great cobbler using canned filling when I was a child. So, to honor her and the work she put in for me, I wanted to use her crust for this dessert. The topping is buttery, and best of all, the sides tend to crisp around the edges. While the topping for our strawberry cobbler is sweeter than most, it blends well the buttery richness. This recipe is one of my favorite cobblers, and I am thrilled to share it with you. I sincerely hope you give it a try or at least use the crust for your version. Thank again for visiting our site, and I wish you a long life, love everlasting, and a full tummy! 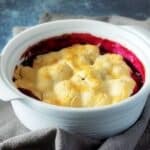 If you like this strawberry cobbler recipe, please leave us a comment and rate the recipe card. You can also find us on Facebook, Pinterest, Twitter and Instagram searching for Berly’s Kitchen! Check out our sensational Summer strawberry cobbler! It's made with simple ingredients and stuffed with plump strawberries and topped with a moist crust. Before starting any part of the recipe, be sure to remove the frozen strawberries from the freezer and let them unthaw completely. Then, drain the excess liquid from the berries. First, in a large mixing bowl, combine all the dry ingredients. You will whisk together the flour, sugar, salt, baking soda, and baking powder. Next, melt the butter and combine it with the mixing in a measuring glass. Afterward, slowly add the liquid mixture to the dry mix and use a spoon to blend everything together. The dough should start pulling away from the side of the bowl. As you mix, form the dough into a ball. Now, cover the bowl and place it into your fridge to rest for at least 30 minutes. In a large mixing bowl combine the berries, sugar, and lemon juice. Toss the ingredients together to coat the strawberries with sugar. Next, slowly add the cornstarch to the berry concoction. I would only add a tablespoon at a time until the strawberries and coated. The reason why you don't want to dump the cornstarch into the bowl is that the amount varies depending on how much liquid you have left in the strawberries. If there is a lot of liquid, use the whole 1/4 cup. Preh-heat your oven to 400 degrees F.
After everything is prepared, spray a 9 by 13-inch baking dish with non-stick cooking spray. Then, remove the dough from your fridge and dust your counter with flour. Also, dust the dough with flour because it will be sticky. Gently place the crust on the counter and roll it out into 1/4 to 1/2 -inch thickness. Go ahead and transfer the strawberry filling from the mixing bowl to the baking dish. Now, transfer the crust to the baking dish completely covering the filling. Be sure to tuck in the sides of the dough into the berry mixture. Last, place the cobbler into your pre-heated oven and allow it to cook for at least 30 to 40 minutes or until the crust has cooked thoroughly. You may also use and egg wash on the cobbler to give it that golden brown appearance. Let the cobbler cool for at leats 20 minutes before serving the dessert. The calories listed are an approximation based on the ingredients and around 11 servings. For a thinner filling reduce the cornstarch to one tablespoon. Preparation time includes letting the dough rest in your fridge for at least one hour. never met a cobbler I didn’t devour, and I see no reason to delay making yours! this looks amazing! I was getting hungry looking at the pictures! Omg this looks soooooo delicious and perfect for summer. The top looks soo flakey, YUM! Oh my! This sure looks delicious, thanks for sharing the recipes. It has nice look !! I love the strawberry !! Thank you !! Yum! And I think strawberries might be getting ready around here after the sun we’ve had all week. Everything’s about a month behind due to cold, wet spring. Thanks for sharing the recipe and giving me something new to try. Looks delicious & I’m not even a big fan of cobbler! I love cobblers but have never tried a strawberry one before. Can’t wait to try. What a great way to use all this strawberries we get in a strawberry season . My kids will love it! Since I’ve just got a bushel of berries, this recipe rocks! I will be substituting the flour as my son is GF, but I can’t wait to make it for dessert tonight! Strawberries are my all time favourite fruit. I so love Summer when they’re at their best! This cobbler looks beautiful, I love a good comforting dessert filled with delicious fruit! OMG, give me alll of this. I am in lvoe with anything strawberry this time of year, and this looks ah-maze!